Citation Information: J Clin Invest. 2003;112(10):1541-1549. https://doi.org/10.1172/JCI18370. Although capillary barrier deterioration underlies major inflammatory lung pathology, barrier-enhancing strategies are not available. To consider hyperosmolar therapy as a possible strategy, we gave 15-minute infusions of hyperosmolar sucrose in lung venular capillaries imaged in real time. Surprisingly, this treatment enhanced the capillary barrier, as indicated by quantification of the capillary hydraulic conductivity. The barrier enhancement was sufficient to block the injurious effects of thrombin, TNF-α, and H2O2 in single capillaries, and of intratracheal acid instillation in the whole lung. Capillary immunofluorescence indicated that the hyperosmolar infusion markedly augmented actin filament formation and E-cadherin expression at the endothelial cell periphery. The actin-depolymerizing agent latrunculin B abrogated the hyperosmolar barrier enhancement as well as the actin filament formation, suggesting a role for actin in the barrier response. Furthermore, hyperosmolar infusion blocked TNF-α–induced P-selectin expression in an actin-dependent manner. Our results provide the first evidence to our knowledge that in lung capillaries, hyperosmolarity remodels the endothelial barrier and the actin cytoskeleton to enhance barrier properties and block proinflammatory secretory processes. Hyperosmolar therapy may be beneficial in lung inflammatory disease. Barrier quantification in lung venular capillaries. (a) Semilogarithmic plots of split-drop volume versus time from single capillaries in which the oil drop was split with 4% albumin at the indicated Pc (numbers above and below lines). 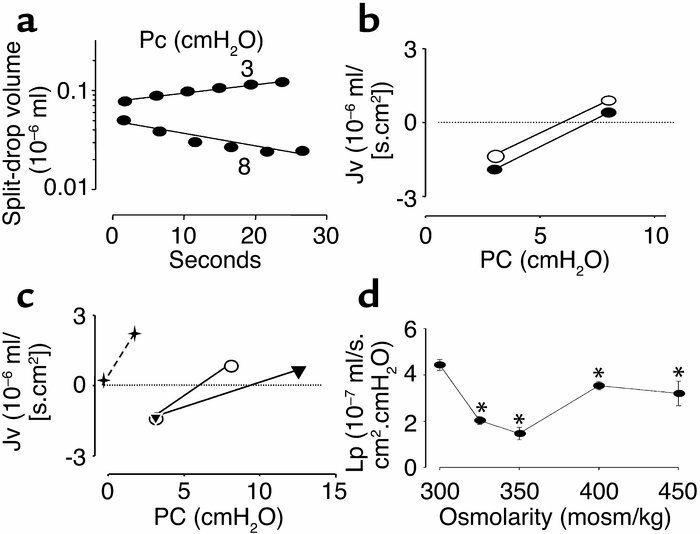 (b and c) Plots are data from single capillaries given no infusion (open circles), or a 15-minute infusion of isosmolar Ringer’s buffer (300 mosm; filled circles), and a 1-minute (stars) or 15-minute (filled triangles) infusion of hyperosmolar sucrose (350 mosm). The corresponding Lp values (10–7 ml/s × cm2 × cmH2O) were 4.4, 5, 9, and 1.5. (d) Group data show Lp responses at baseline (300 mosm) and after 15-minute sucrose infusions of different osmolarites. Mean ± SD; n = 3, each point. *P < 0.05 compared with baseline.